Albion, P.R. & Maddux, C. (2007). Editorial: Networked Knowledge: Challenges for Teacher Education. Journal of Technology and Teacher Education, 15 (3), 303-310. Waynesville, NC USA: Society for Information Technology & Teacher Education. Retrieved April 23, 2019 from https://www.learntechlib.org/primary/p/24427/. Becker, H J., & Ravitz, J. (1999). The influence of computer and Internet use on teachers’ pedagogical practices and perceptions. Journal of Research on Computing in Education, 31 (4), 356-384. Ertmer, P.A. (2005). Teacher pedagogical beliefs: The final frontier in our quest for technology integration? Educational Technology Research& Development, 53(4), 25-39. Hadley, M., & Sheingold, K. (1993). Commonalities and distinctive patterns in teachers’ integration of computers. American Journal of Education, 101(May), 261-315. Jonassen, D.H. (1991). Objectivism versus constructivism: Do we need a new philosophical paradigm? Educational Technology Research& Development, 39(3), 5-14. Maddux, C., Sprague, D., Ferdig, R., & Albion, P. (2007). Online educa-t ion : Issues and research questions. 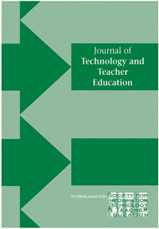 Journal of Technology and Teacher Education, 15(2), 157-166. Paulus, T.M. (2005). Collaborative and cooperative approaches to online groupwork: The impact of task type. Distance Education, 26(1), 111125. Rakes, G.C., Fields, V.S., & Cox, K.E. (2006). The influence of teachers’ technology use on instructional practices. Journal of Research on Technology in Education, 38(4), 409-424. Sandholtz, J.H., Ringstaff, C., & Dwyer, D.C. (1994). Student engagement revisited: Views from technology-rich classrooms (ACOT Research Report No. 12). Cupertino, CA: Apple Computer.